The European Union is in a systemic crisis. This crisis is also economic, social and political in the sense that it is a crisis of confidence - not only of the financial markets but also among the member states and the citizens of the EU. 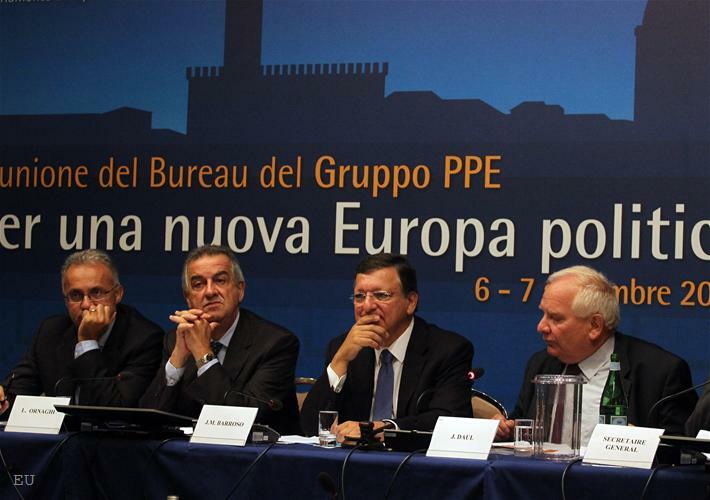 This is what European Commission President Jose Manuel Barroso said at the meeting of the European People's Party bureau meeting in Florence, Italy, on September 7th. This is why the solution should also be political, Barroso added in a speech that marks the beginning of an intensive political autumn in the EU. The selection of timing, place and method of delivery of this speech are quite important in terms of the evolutionary cross roads which the EU is at right now. The speech was delivered in the very beginning of the new political season. The place was the political group of the European People's Party which, as will become clear later, is an attempt for cleaning their own house first. And in the end, the method - Jose Manuel Barroso spoke for almost 15 minutes without reading. He had pieces of paper in front of him which he seemingly used as starting points. The target of his speech were as the EPP members so the entire European and international community and in fact it is a preparation for his state of the union address on September 12th. The most important thing in his speech before the EPP was the attempt for a self analysis. "But we have to recognise that more steps of integration will need to be achieved, namely some may require in an appropriate time a revision of the Treaties. Why? Because we are needing more share of sovereignty. The sovereignty has to be shared and with more integration comes the need for more democracy. [...] Those who think that democracy is only national they have not understood that we are now in the 21st century, where many of those challenges are by definition transnational, like what's happening in the financial markets. So, that is why national democracy is not enough". The state of the union address takes place in the European Parliament, which under the Lisbon Treaty has enhanced powers and has turned into an important factor in the decision making process. This is why, the statement that the role of the European Parliament in building the European democracy would be essential was a strong signal for Strasbourg. He went back to describe the crisis, adding to the above mentioned also a crisis of values. Mr Barroso recalled that the union is founded on the rule of law and when governments themselves do not abide with the rules they had committed to this only creates confidence issues. And in fact the problem is not only confidence, as it becomes clear from the statement of the president of the European Commission, but that the Union is much more than a union of several states. It is about much more real interconnectedness which the euro has deepened further. This is why, when in a union of different countries there are different policies imbalances are created. "This is why we need more harmonisation of norms and respect for norms", Barroso underlined. This, in his words, meant more Europe - a more integrated system of decision making. "But it's not just about more Europe. It is about a better Europe", he added. What the European Commission chief added in the context of values, however, surprised: "[We need] A Europe based on values. And it is why, for instance, it is critically important that all the member states respect the rule of law and the values of democratic, pluralistic, free societies. That is why I want to say that I'm very happy and proud of the role that the EU Commission has been playing in the issues appearing in Romania. It was thanks to the European Union and the European Commission that it was possible to avoid undemocratic changes in Romania and that we should be proud of it. Because we have been able to restore the rule of law in a country that is a member of our union". These words of his were met with applause which, although lifeless, were the only ones during his entire speech. The surprise from mentioning Romania was indeed big because there were hesitations how to approach the Romanian case as it cast a significant shadow over the Union's efforts to help the democratisation processes in its nearest neighbourhood and gave reasons to its critics to say "you cannot handle your own problems, stop preaching us". This is precisely why one could have expected not only Romania to be mentioned but Hungary as well, despite the fact that Prime Minister Victor Orban is from the EPP's political family. The party was criticised several times for keeping silence about the same undemocratic violations of European values by Orban while in the same time criticising without shame the deeds of the Romanian Victor (Ponta), who, though, is from the enemy political family - that of the socialists. Besides, it seems a little bit too early the Commission and the EU in general to hasten to congratulate themselves with the restoration of the rule of law because in Romania there will be elections soon and Prime Minister Victor Ponta seems to be more worried about his country's image abroad rather than about sticking to values. 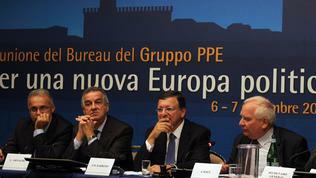 But the very fact that Barroso mentioned that case can be interpreted as a gentle hint because in the end of his speech he ostensibly by the way and without giving specific examples said in the context of EPP's responsibilities: "There is another very important issue that the EPP has a great responsibility with because the EPP is all over the EU - from the founding members of our Union to the new members - those who knew recently what was totalitarianism and communism and have a real, a very concrete memory of what means totalitarianism, of what means communism. That is why they are the ones we can make the case at European level for a union not two. We don't have two unions, we have one union, one European parliament, one commission, we don't want new dividing lines in Europe". 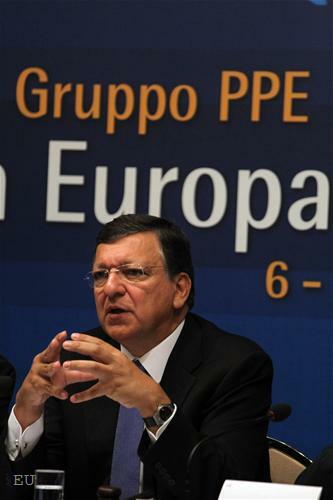 Barroso made it clear that he is fully aware of the weaknesses of some of the EPP's members talking about the need to find the right balance between solidarity and responsibility, underscoring that the EPP as a political culture is ь party that contains that compromise. But, he added, "I know that some would prefer just solidarity, receiving the help of others but not doing their own homework. No, we need solidarity and responsibility; we need convergence and discipline; we need growth and stability". And more, but this time regarding the debates on Budget 2014-2020: "That is why we need cohesion, yes, but cohesion with discipline. It is not just money for to spend just for something that nobody really believes it can bring more competitiveness. That is why we need to make this combination between cohesion and discipline, proper conditionality so that investments are really made in what can bring prosperity and not just to feed clientèles at national or regional level". Here, again, it would have been better if he gave concrete names because mentioning only Romania is not enough for the purge the EU desperately needs in order to continue forward in its current form and to avoid a division between those who are ready for change and those who are incapable of it. If the EPP was a genuine European party and not a gathering of defining themselves as right-wing but often differing in their visions national right-wing parties, and if he had to stand in primaries he would have probably won. Alas, this is precisely the biggest problem the Union is facing and Barroso is right when he says that the Union cannot be divided into south and north, east and west. Instead, the division between national and European politics is very distinct. 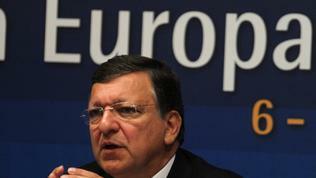 Something in Jose Manuel Barroso's tone and words shows that he is aware of that division. "So what we need is to combine the European democracy with the national democracies and not to pretend that we don't need a European democracy and that we are weakening our European democracy. [...] We need to look at our institutions and to have a horizon for the future". He is not the only one who is aware of that but also the other chiefs of European institutions who most strongly face the national element when attempting to defend the European interest. The leaders of some member states are also aware, especially of Germany, whose Chancellor Angela Merkel called recently for work to begin by the end of the year on a new EU treaty. It seems that the chiefs of European institutions are ready for that. One of the questions this autumn will be how many and which national leaders are ready for that too. Another question will be to what extent are the national political leaders ready to move to the European level.